We once noted an interesting observation by Columnist Bret Barquest that a series of mind-shattering events occurred within weeks of one-another during the summer of 1947, just after the end of World War II. --The discovery of the Nag Hammadi Codices, a series of gnostic documents believed left by early followers of Jesus, in a cave in Egypt. The books included the Gospel of Thomas, the Gospel of Philip, the Apocryphon of John, the Gospel of Truth, the Secret Book of James, and Apocalypse of Paul, the Apocalypse of Peter, and a letter of Peter to Philip. Many of these writings have since given new insight as to the real identity and fate of the man the Christians say was god. --The discovery of an estimated 500 manuscripts, now known as the Dead Sea Scrolls, in 11 caves on the shore of the Dead Sea, just east of Jerusalem. 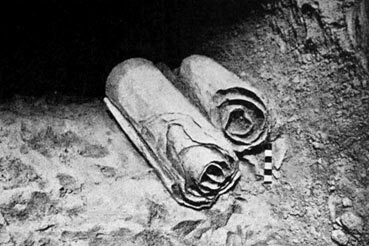 The scrolls were said to contain fragments of every book in the Old Testament. But there was more. Other books, including prophecies by Ezekiel, Jeremiah and Daniel, and psalms believed written by David and Joshua, all of it excluded from the Bible. There were many other documents, also providing new insight as to the real identity of Jesus, were discovered. All of this was seized by the Vatican and it has remained under wraps ever since. --The Jews in Europe and Russia began an exodus to Palestine after proclaiming an Old Testament story that they were a chosen people and had been given this land by God. They literally moved in among the Palestinian people, established a country, and became officially recognized by the United Nations as the new state of Israel by 1948. This was strangely a Bible prophecy that was carried out by the Jewish people. The existence of Israel, on Palestinian soil, has been a political nightmare for the world ever since. --The final world conflict was over, the United States had emerged as the greatest world power after winning wars in Europe and Asia, and exploding two atomic bombs over Japan only two years earlier. That summer the U.S. created the Atomic Energy Commission, the Central Intelligence Agency, the National Security Council, the Department of Defense and the Joint Chiefs of Staff, all designed to be watch dogs over not only America, but the rest of the world. The names of all of these agencies have become well known to everyone since that time. --And for what it is worth, the term "flying saucer" was created that summer after pilot Kenneth Arnold observed what he described as a strange disk-like object flying over Mt. Rainier, Washington. At that time, people all over the United States began reporting similar sightings. To add to the strangeness, the so-called crash of one of these strange flying machines allegedly occurred near Roswell, New Mexico that summer. After a military intelligence officer told the newspapers that a flying disk had crashed there, the government quickly clarified the story, saying it was only a weather balloon. Conspiracy theories have abounded about Roswell ever since. This writer was a young lad of nine that summer, but there are striking memories about all the flying saucer talk. As the son of a research chemist who also was an ardent science fiction buff, I quickly developed a keen interest in the probability of ships visiting Earth from other worlds. I began reading all I could about these strange flying craft. Little did I know that the mystery would still be with us today, or that I would be among the many people in the world to observe and possibly become an unwilling passenger in these craft. Indeed, 1947 was a really magical year all around. I remember that it was the year we had a snowstorm so terrible our town was cut off from the outside for weeks, and there was a forest fire in Canada, just north of our Michigan home that send a strange cloud of smoke overhead. It gave everything an odd yellow hue for a day or two. We owe writer Barquest a debt of gratitude for linking all of those important, world-shattering events together as he did. Each of them has had a profound effect on the way the world has behaved and thought since those amazing days in the summer of 1947. It was time for the old and antiquated religious systems to be torn down and replaced by new spiritual pathways so that humans could begin to evolve and turn away from the destructive behavior of warfare and collective greed. The miraculous discovery of ancient documents that should have opened the eyes of the world to the Christian cult, the appearance of evidence that aliens were among us, and the move by the U.S. government to create the political machinery for the final world conflict, should have shaken us to our roots. But that did not happen; at least right away. The events of 1947 led to a slow awakening and world change that is still in the process of occurring. It is only recently that the UFO scare of the 40's and 50's has evolved into an awareness that we probably are not alone in this amazing universe. It has taken years for scholars to sift through the volumes of material contained in the scrolls, interpret the writings and report their findings to the world. It wasn’t until 1991, 44 years after the first scrolls were found, that pressure for publication grew. Since then the books and writings of the researchers have been slowly seeping into social consciousness. The problem with this is that it happened so slowly, and without fanfare, so only a few of us bothered to read those important works. I found my reading in an occult book store in Ann Arbor, Michigan and it jolted me out of Christianity like a thunderbolt. Statisticians now report that Christianity appears to be an outmoded and dying religion. Fewer and fewer people are attending church. We have been continuing our research, writing articles and trying to get this new information out there ever since. Our biggest problem has been determining the differences between truth and contemporary fiction.